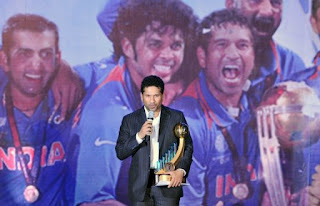 Record-breaking batsman Sachin Tendulkar on Tuesday received India's cricketer of the year award for his outstanding performances in 2009-2010. Tendulkar, the world's leading scorer in both Test and one-day cricket, won the Polly Umrigar award, named after a former India captain, at a function held by the Board of Control for Cricket in India (BCCI) in Mumbai. The master batsman scored 1,064 runs, including one double-century and five hundreds, in 10 Tests during the year in question, October 2009 to September 2010, at an average of 82. Tendulkar also scored 695 runs in 12 one-day internationals, including the first double-century in one-dayers, against South Africa in Gwalior in February 2010. Former Test all-rounder Salim Durani received the C. K. Nayudu award, named after another former India skipper, for his lifetime contribution to the game. Durani, an exciting stroke-player and effective left-arm spinner, played 29 Tests from 1960 to 1973, scoring 1,202 runs and taking 75 wickets, including a major role in India's maiden Test series victory in the West Indies in 1971. Then, he dismissed key batsmen Gary Sobers and Clive Lloyd in the second Test in Trinidad to help India win by seven wickets. Manish Pandey, a 21-year-old from Karnataka, won the best batsman award in domestic cricket for scoring 882 runs in nine matches in the country's premier first-class tournament, the Ranji Trophy. Karnataka paceman Abhimanyu Mithun, who bagged 47 wickets in nine matches in domestic cricket, won the best bowler award. India's World Cup-winning squad was also congratulated at the event.